Cake Batter Overnight Oats are a sweet and healthier make-ahead breakfast. 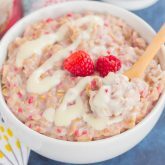 Hearty oats, Greek yogurt, and milk combine with the classic taste of cake batter, in oatmeal form. 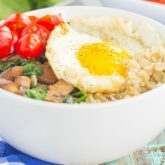 Whether you like your oats hot or straight from the fridge, this easy breakfast will fuel you all morning long! One day closer to Friday, but we’re not quite there yet. So, I thought you could use a little sweet, but healthier, dish to brighten up your week. If you’ve been hanging around here long enough, then you may already know that funfetti or cake batter anything is a winner in my book. But, since it’s been way too long since I’ve shared those flavors with you, I thought I would redeem myself, starting with an easy breakfast. 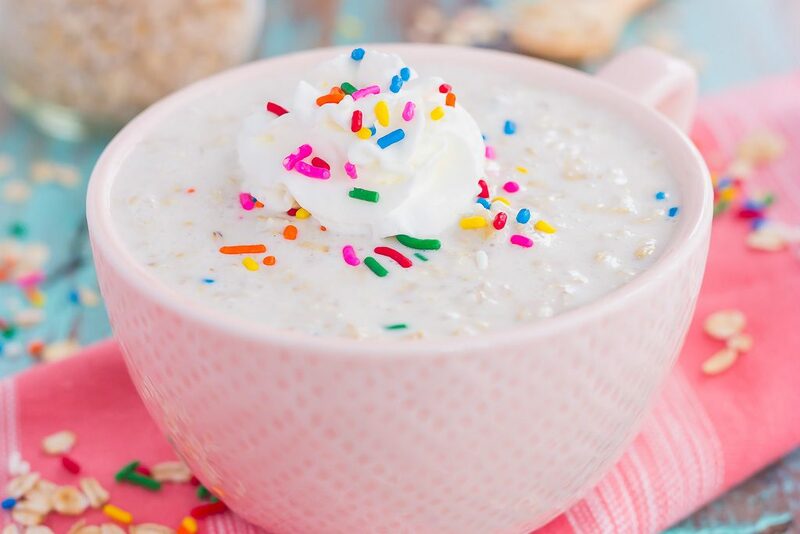 If you have a sweet spot for cake batter treats, then these Cake Batter Overnight Oats will keep you coming back for more. Smooth, creamy, and packed with flavor, these are the ultimate overnight oats. And I know my overnight oats! From this Pumpkin Pie version, to those Blueberry French Toast Overnight Oats, to these Strawberry Nutella ones, I think it’s safe to say that I’m no stranger to experimenting with flavors. And the secret to the cake batter taste? Butter extract! The first time I heard of butter extract, I was a little (ok, a lot) skeptical of its powers. I mean, why would anyone want to use an extract in place of butter?! But, after experimenting with it a little, I loved the subtle hint of buttery goodness it added to cakes, cupcakes, and even waffles…without the extra calories of regular butter! 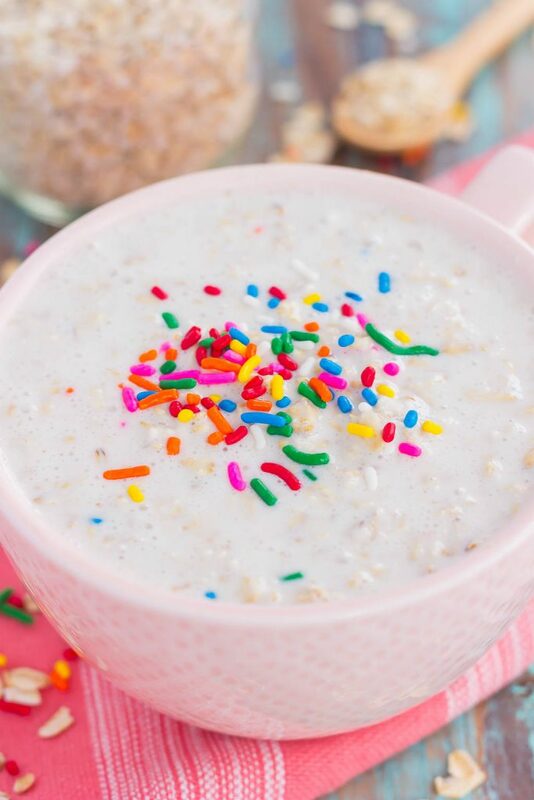 Besides the deliciously sweet taste of these Cake Batter Overnight Oats, they’re also fun to look at. Sprinkles makes everything better, right? And if you’re in the mood, top these oats with a touch of whipped cream, just for that true “cake batter” experience. Trust me…it’s worth it! A little goes a long way! Start out with using 1/4 teaspoon of butter extract. If the taste isn’t strong enough, add a splash more…but not too much, otherwise it will be overpowering. I used approximately 1 tablespoon of sugar to sweeten these oats. However, honey or maple syrup would work well, too. So if you’re an overnight oats lover like I am, then these Cake Batter Overnight Oats will make a tasty (and healthier!) breakfast or mid-morning snack! In a medium bowl, mix together oats, milk, yogurt, sugar, vanilla extract, and butter extract. Pour into two mason jars or an airtight container(s) with lid. Refrigerate for at least 4 hours, or preferably overnight, so that the oats will soften and absorb the liquid. 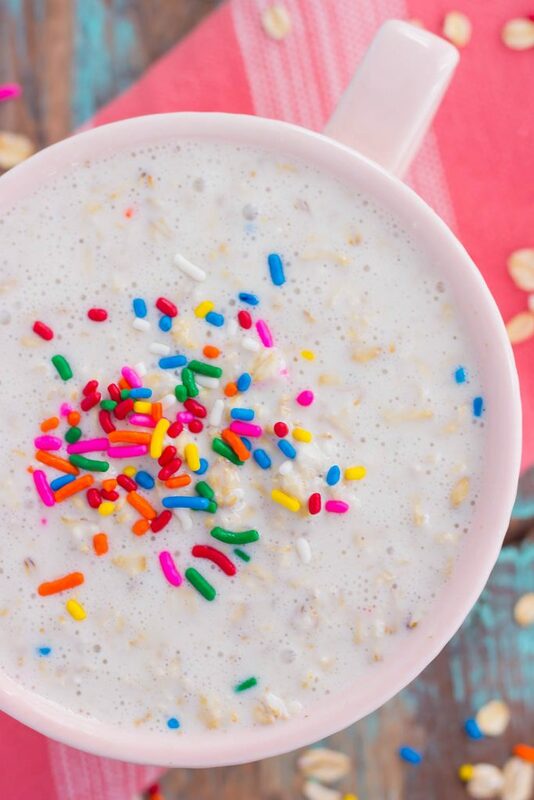 Remove from refrigerator, add sprinkles to oats, and stir. Top with more sprinkles, if desired. This is brilliant and fun!!! Perfect for birthdays and Valentine's Day coming up!!!! I love overnight oats!!! This has got to be the prettiest breakfast ever! It's just so sweet! 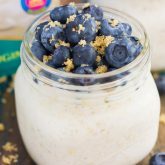 I love all the creative twists you have for overnight oats, Gayle! You've come up with yet another winner! Thanks, Annie! Overnight oats are so fun to experiment with! Butter extract?! Say what? I have got to look for that stuff! These overnight oats look too cute, Gayle! It's impossible not to smile just looking at! So fun with the whipped cream and sprinkles too. Pinned, of course. I bet my niece and nephew would love this too. I know it, actually :) I'm happy we are one day closer to the weekend too....can't come soon enough. Have a wonderful one!! Butter extract can be dangerous! :) Thanks for the sweet comment and pin, friend! I loveee me some overnight oats and this is such a fun flavor! Plus, sprinkles would brighten up ANY morning!! Thanks for the sweet comment and pin, Demeter! You MUST try butter extract, it's almost life-changing! :) Happy weekend to you, too! These look great! I'm obsessed with cake batter everything, and butter extract is definitely the key to getting that flavor right. I like to use vanilla protein powder in the mix for added sweetness, flavor, and protein. YUM! Thanks for the inspiration! I'll have to try vanilla protein powder! That's a great idea, Blair! Thanks for the kind words! These sound and look awesome! Wonderful flavor! Love cake batter!!! Can't wait to try them! Yes please! this sounds awesome Gayle! Ahh this looks so good! Perfect for the weekend. Thanks for the kind words and for stopping by, Celia! Thanks for the sweet comment and for stopping by, Muna! You know I love my overnight oats, and how fun are these? I really need to try mine with sprinkles some time -- what a day brightener! This is such a great flavor, Gayle -- my kids would just love these! Thanks, Marcie! The sprinkles are so fun! Wow - butter extract - you learn something new every day! 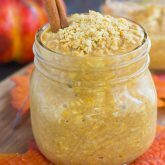 Overnight oats are one of my faves, and this version looks like so much cheery fun! I really do not know what it is, but rainbow sprinkles DO ME IN everyyyyyyy time! Rainbow sprinkles are the BEST! Love how pretty and festive this is! 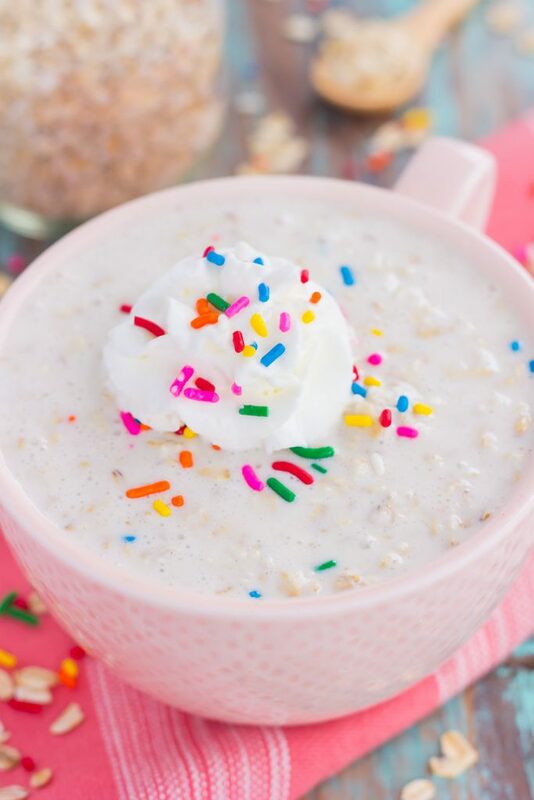 Overnight oats are a favorite around here and these fun sprinkles would totally make everything better!